“Hhuuttt,” the soft, subtle cluck sounded closer. A pitiful sigh oozed from frustrated lungs. A warm, pleasant October sun hugged a distraught woodsman as he sat back against a solitary cedar trunk. The sweet scent of drying corn perfumed the grassy clearing, but did little to dissuade the somber mood. A moist tongue damped parched lips. Tired eyes squinted through brass-rimmed spectacles that eased up and down, seeking the best focus. Still gripped by the left hand, the white page rested upon the weary hunter’s thighs. The woodsman’s right index finger stopped at each notation on the bottom of the page. Fifty-four paces distant, less about six, a wild turkey hen emerged from the cedar grove and walked tall into the afternoon brilliance. A few herky-jerky steps and the bird paused. It looked north, then south. A half-dozen cautious steps westward brought the fowl to the first wagon rut. It turned its head a bit, then pecked the ground twice. Gaze north…gaze south…five steps to the second rut ended with another pause and the same concerned surveying of the sun-drenched clearing. The bronze beauty stood for several minutes. A red-tailed hawk circled silent over the far ridge. Sandhill cranes chortled off in the distance, near the River Raisin’s lily-pad flats. Four turkey paces beyond the wagon trail the hen whirled around, cocked its head and peered into the cedar grove. The bird’s body grew rigid, exuding woodland alarm. Deliberate steps became longer, quicker strides. I counted twenty in all, but did not chuckle as I so often do. Previous shot load tests, using both lead and bismuth of varying sizes, with natural-material wadding match the results of using cards and fiber wads. To back up these findings, in June, 2015, I had the opportunity to have my natural-wadding patterns evaluated through computer analysis. Both my clay bird and turkey loads scored in the upper percentile compared to modern shot loads fired through a cylinder bore, but six scrumptious wild turkeys plus a few squirrels and rabbits already knew that to be true. 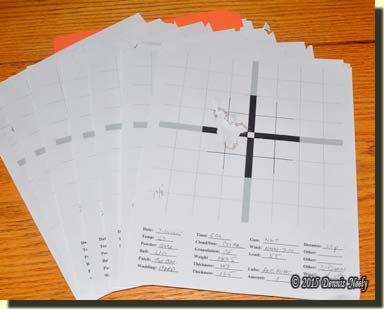 To achieve a satisfactory answer, I felt I needed a baseline target using a competition load that produced the best performance from “Old Turkey Feathers.” The goal was to establish “an average group” that represents “repeatable consistency,” not a fluke, one-hole group that can only be achieved once every how many targets when five lucky shots just happen. To minimize human error I shot using a bench rest. I began at 25 yards with the intent of working my way out to a maximum effective distance, which I thought would be about 65 yards, give or take. In recent years, especially when loaded with natural wadding, I like to limit the selection of my lairs to offer a maximum shot of 50 paces and under. But the results of the first practice session were disappointing; the groups averaged about six inches, center-to-center, at 25 yards. These groups were not consistent with past competition experiences. I spent an hour or so reviewing the notes in Old Turkey Feathers’ file. One-by-one I eliminated past issues. I sought advice from other shooters, including a couple of bench rest competitors who have never steered me wrong. The groups tightened a bit, but never approached what I knew the smoothbore was capable of. Then on that afternoon in October, I decided to see what I could do at 50 yards. Ten shots later I was stunned to the point of sitting against that cedar tree. When the hen turkey turned around and headed back in front of the 50-yard target frame, I decided I better change my course, too. I believed I had exhausted all possibilities associated with the gun and the load. All that remained was me. I reasoned that if the problem was my eyes, then I should see similar disturbing results firing a different gun. I have a .40-caliber Dickert rifle that I built in the late 1980s. An hour later I was back at the range dumping off a fouling shot. I was shaking; I was scared my eyes might be the culprit. Once calmed down, the first shot on a fresh target on the 50-yard board hit an inch and a half low and an inch to the left of dead center. I thought to myself that that was respectable, considering I hadn’t shot the Dickert in about eight years. All ten shots hit low, but including two flyers to the right, the center-to-center group was two inches by two and a half inches. My eyes were not the problem, much to my relief. Perplexed, I again sat against the cedar tree as I thumbed through the targets. That hen, I assumed it was the same one, clucked again. I expected her to walk out, farther down range. As I watched and waited, my mind mulled over the variables. With a start, I realized I just shot out of the fixings in the .40-caliber box, using a different can of 3Fg black powder. After posting a new target on the 50-yard frame, I duplicated Old Turkey Feathers’ last load, only I used powder from the .40-caliber can. When I purchase powder, I write the date on the top with a felt pen. To be sure the contents were different I checked the batch numbers on the can bottoms. The first death sphere hit an inch low and an inch to the left. Four shots later I saw a group that was consistent with what I know the Northwest gun is capable of—just shy of four inches. The next ten shots at 25 yards grouped low and to the left in a ragged hole that measured two inches, center-to-center. I penciled “2 ¾ inches” on the target, taking into account the one flyer that wandered above the centerline. That problem nagged me for several months. The loss of accuracy was particularly troubling, because it was not consistent with thirty years of competitive shooting history. Further, I was very careful to fiddle with only one loading component at a time as I tried to discover what caused the change. To make matters worse, in Old Turkey Feathers’ file there is a note regarding the time I tried a new powder manufacturer at the urging of several other smoothbore shooters at Friendship. That was a dozen years ago. My trade gun did not shoot well with the new brand. According to the note the groups opened up a couple of inches and the bore fouled more than normal with their 3Fg granulation, at least with a round ball. The powder performed just fine with a shot load, so I burned it up on the quail walk and sporting clays ranges. About a quarter of the can remains, and it is marked accordingly. Again, out of curiosity, I plan to see how it performs in the Dickert rifle and at the pattern board. By mid-October I had the baseline load that I needed, and I worked on adjusting several natural material wadding combinations. I discovered I can shoot better with my re-enacting glasses than I can with my daily pair and most important, that the grouping problem is not my eyes. This entry was posted in Research, Safety, Wilderness Classroom and tagged Black powder hunting, Dennis Neely, historical trekking, Native captive, North West trade gun, Northwest trade gun, trade gun, traditional black powder, traditional black powder hunting, traditional blackpowder, traditional blackpowder hunting, Traditional Woodsman. Bookmark the permalink. I am currently working up loads for my antique 12ss. After reading this and your post on ff vs fff I am going to switch over to ff and work up my turkey loads. A friend has some ff tripple seven ff but am worried about using it in an antique gun. May hold out until I can goex. For the sake of “accuracy,” I was using a can measuring valve in conjunction with my normal adjustable brass measure. When I turned the can up to measure out the charge, I had to shake the can to fill the measure. In the midst of these tests, I thought the “fines” settling might be the problem, so I stopped using the valve and went back to my old way of measuring. I had the same result, but in hindsight, I now believe that can no longer had an even distribution of granule sizes, but there is no way of testing that hypothesis. 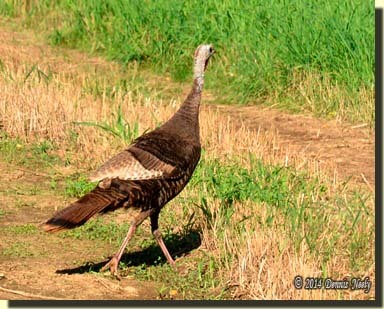 What I do know is that when I switched powder lots, Old Turkey Feathers’ errant behavior corrected itself.